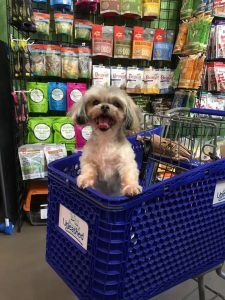 After adopting a puppy from a rescue in California, JP Phinney and his wife, Amy, felt inspired to research the proper care and nutrition for dogs. They adopted Benny, their puppy, and soon discovered that it was difficult to decide what was best for their dog, especially when it came to food. “We started to question where our information was coming from,” said Phinney. After many months of research, Phinney found that to make sure he was providing a nutritious meal for his pet, he had to look at the protein content and where the protein came from. Because animals are carnivores, the quality of the protein in the food is important for their nutrition and the protein must be animal sourced, rather than vegetable or carbohydrate sourced. Incorporating animal sourced protein in pet food provides the animal with a full amino acid profile. With a large number of pet parents lacking knowledge about the food they were feeding their pets, Phinney reached out to smaller manufacturers, producing quality products, who didn’t have the money to break into the mainstream. At the time Phinney began his initial research, he was working at Goodyear Tires and did not have the funds to start a business. 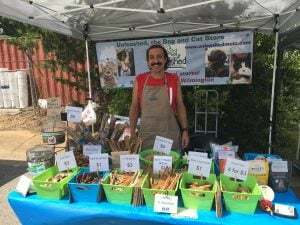 He sold an old Buick car for $500 and put it all towards an initial inventory of all-natural treats and chews, for a booth at the NC State Fairgrounds Flea Market in 2007. The booth at the Flea Market became six brick and mortar of Unleashed, the Dog & Cat store! A native of Raleigh, JP Phinney met his wife, Amy, at Sanderson High School in English Class. “The best thing is got from high school is Amy,” said Phinney. JP and Amy have worked side by side throughout the entire process. JP would work at Goodyear Monday through Saturday, meeting Amy at the Unleashed booth at Flea Market on Saturday afternoons. Unleashed soon began to grow, with an invitation from the NC State Fair. At this time, Phinney was not certain Unleashed would pay the bills but decided to fully commit to the business. He quit his job at Goodyear in August 2007 and from then on, the Phinney’s both worked full-time at Unleashed. Amy Phinney graduated college at the top of her class, in the Cameron Business school, at the University of North Carolina at Wilmington. “Hence our Wilmington store,” said Phinney. Unleashed has six locations, including their first location at Lake Boone in Raleigh, Stonehenge Market in Raleigh, Landfall Shopping Center in Wilmington, Crescent Commons in Cary, Crabtree Valley Mall in Raleigh, and City Market in downtown Raleigh. “We are very hip and trendy now that we are downtown,” said Phinney. He is very thankful for his 36 employees across the six locations when it comes to managing it all. For first-time business owners, Phinney gives the advice of “start small and start now.” He stresses that no time will be the right time. Phinney explained that having his start in the Flea Market was a great opportunity for Unleashed. They did not have to take out any kind of bank loan, and Unleashed has still yet to take out a loan. “We have only grown to what our business can bear,” said Phinney. It is still difficult for Phinney to comprehend the growth that occurred for Unleashed and he says he is very grateful for its success. “Everything has gone pretty well for us. We always make the best of every situation,” said Phinney. At Unleashed, they tend to play Reggae music inside all the stores. When I asked Phinney how he would describe Unleashed as a genre of music he replied, “Reggae, all we strive for is good vibes.” The store is always preaching positivity because that is what animals respond well to. Unleashed partakes in various community outreach programs in the area. “At any given weekend, we turn over our dog washing station in our store to any given rescue,” said Phinney. This allows volunteers to work the station, and the rescue to receive the full proceeds from the weekend. The only advertising that Unleashed uses, is through the sponsorships of rescues in the area. 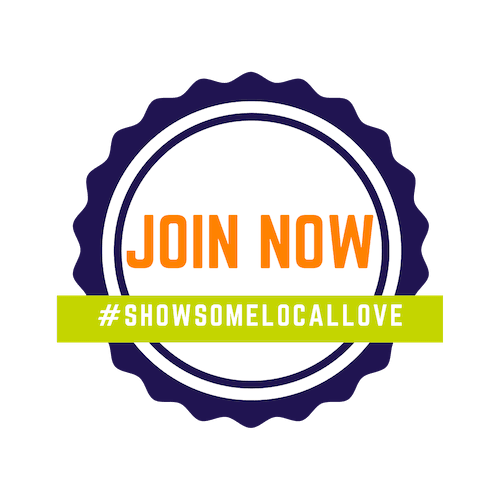 Triangle Family Services and Band Together UNITE Made in the South Awards – Call for Entries!